The beauty of the Dogmatic is that it’s unique Registered Design means it will not ride up, under or into the eyes which causes distress to your pet and as it is much more comfortably and securely fitted, it avoids any potential dangers for you or your dog. Your dog will be more controllable, less excitable and will be safer and easier to train and walk regardless of it’s size! Ease of control is also vital for people with strong, large or stubborn breeds. Dogmatic Leather Headcollars, Collars and Leads are made by an Award Winning Equestrian Company and, if looked after, are an investment. The leather needs looking after in the same way you would an expensive pair of shoes or boots. 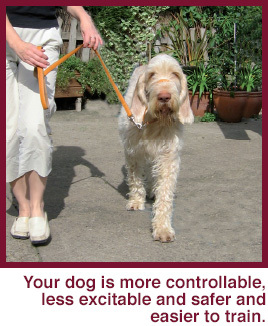 Dog walking will become much easier and the most common behavioural problems such as pulling, lunging etc., are eliminated when using the Dogmatic. Less able bodied people will also find the Dogmatic invaluable as it enables you and your dog to enjoy each others’ company without any distress or discomfort. The Dogmatic should not be confused with a muzzle as it allows your dog to pant, eat, drink and carry a toy whilst wearing it and also has the added benefit of a calming influence! 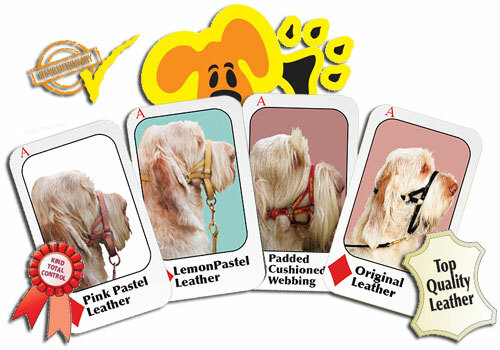 The Dogmatic is available in sizes to fit the majority of Breeds and crossbreeds. 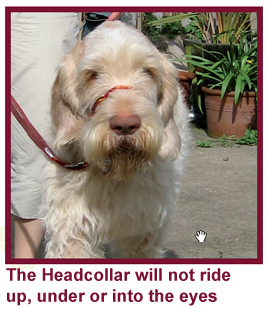 Whatever size or shape of dog, we feel sure we have a choice of Dogmatic Headcollar to suit your needs!